Vanguard Innovation’s ground-breaking online learning platform for primary care staff has surged past an important milestone. Gateway-C, which helps family doctors and other primary care staff more easily identify the early signs of cancer, was launched in May this year across Greater Manchester and Eastern Cheshire. 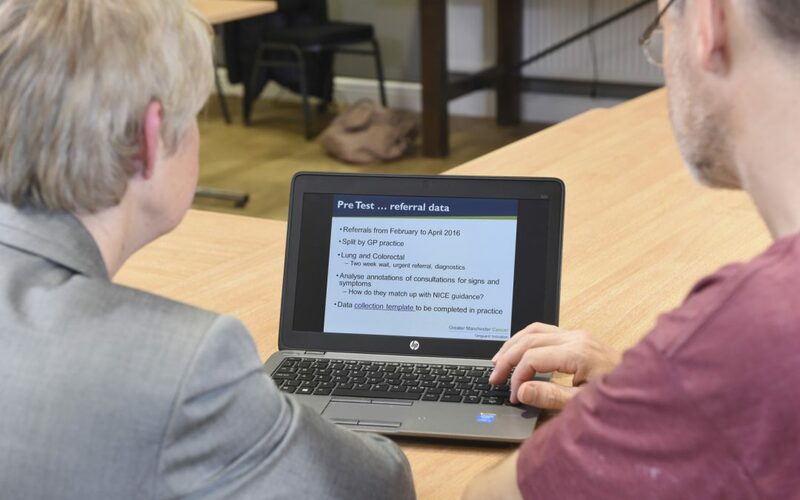 The project team behind the platform set a target of having one member of staff from 60 per cent of the area’s GP surgeries enrol on its online courses by the autumn. Enrolment figures have now reached that target, which means that more than 300 of the area’s 500 surgeries have signed up to Gateway-C.
Dr Catherine Heaven, who leads the Gateway-C project and is Associate Director of The Christie School of Oncology, said the platform had proved its value to primary care staff and feedback from surgeries was excellent. ‘We’re very pleased that the responses we’ve had have been extremely positive. The aim has always been to improve our performance in diagnosing cancer early and we believe Gateway-C can make a very valuable contribution to that goal. A pilot project that took place before the system was launched in May showed that 94 per cent of staff felt the platform had helped them make referrals, while 85 per cent said it had improved their recognition of symptoms; 85 per cent felt more confident in knowing when to refer a patient and 76 per cent said they felt more confident in knowing when not to refer. Gateway-C uses interactive films, based on real-life consultations, and other educational materials to support GPs in identifying potential cancer symptoms by helping them pick up on cues from patients and genuinely attend to what they are saying. The platform’s learning zones, which are accredited by the Royal College of General Practitioners, focus on lung, colorectal and pancreatic cancer while courses devoted to further cancer pathways are in development. Gateway-C has been nominated for an HSJ award: you can read more about that here.